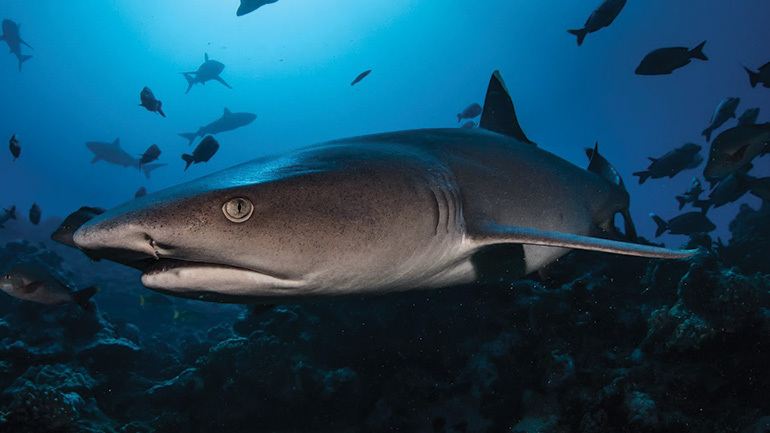 The Best Shark Diving in the South Pacific ! 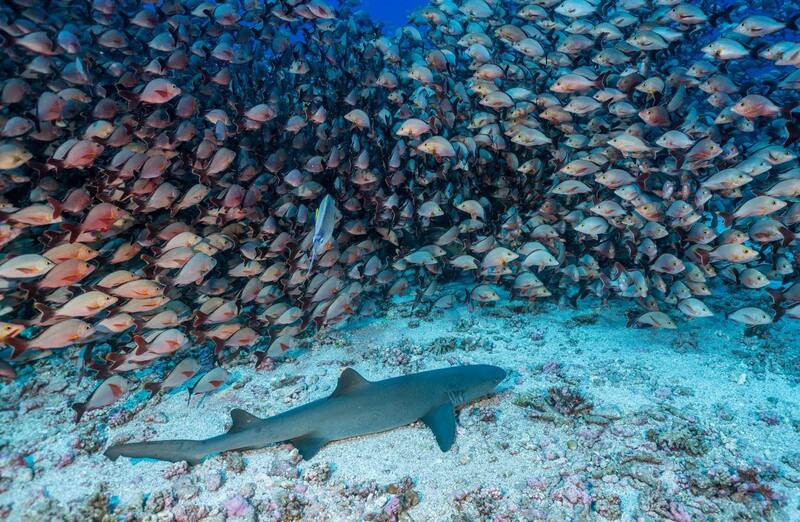 The Polynesian waters play host to many different species of sharks. 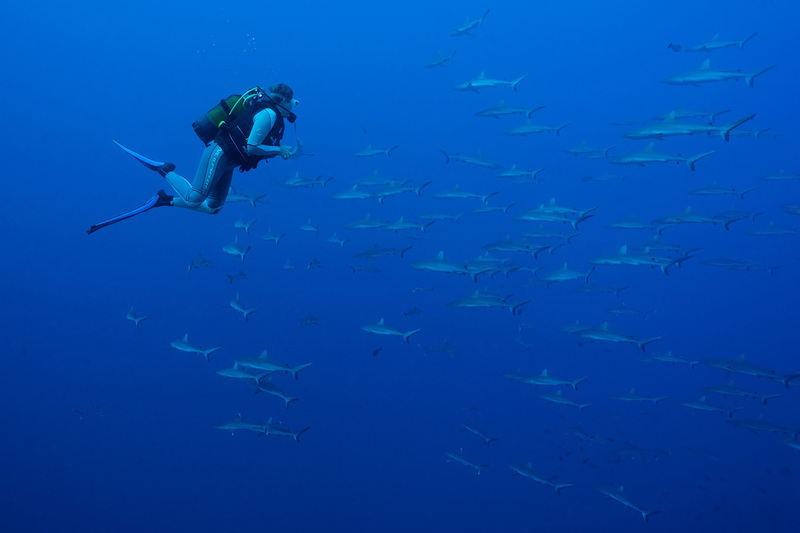 With our experienced divemasters at TOPDIVE, we can assure the safest possible conditions in order for you to observe and marvel at the beauty of this mysterious creature. TOPDIVE Tahiti, Moorea, Bora Bora, Rangiroa and Fakarava dive centers offer a SSI specialty course called, SSI Shark Ecology. 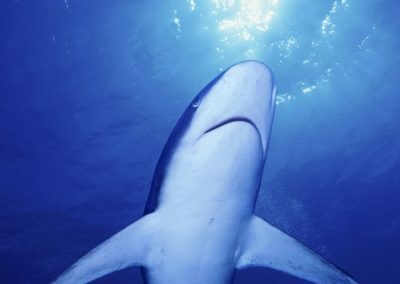 Its purpose is to allow any certified diver the opportunity to identify, recognize and describe shark species in relaxed and secure conditions. The standard dive rule-of-thumb for observation of these species is usually to be slightly negatively buoyant as to adhere close to the sea floor, and not to attract too much attention. Adult size: 5.57 to 6.6 feet. 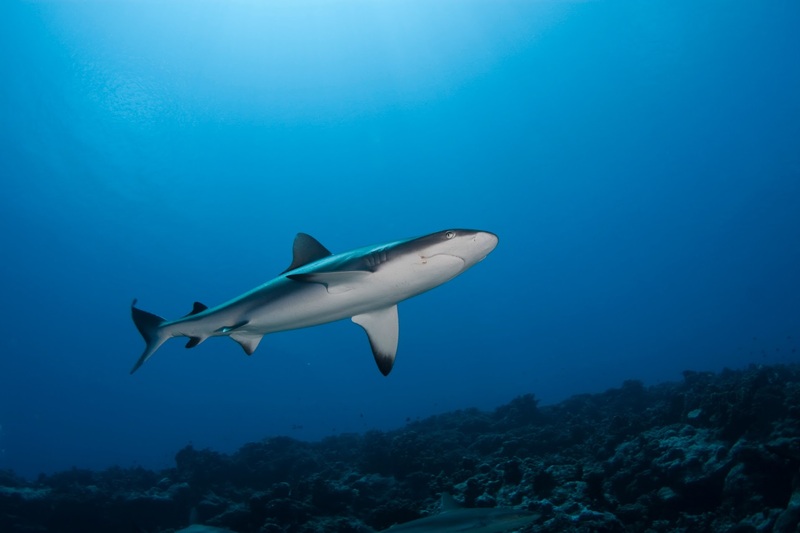 This shark can be distinguished by its white trimmed dorsal and caudal fins. 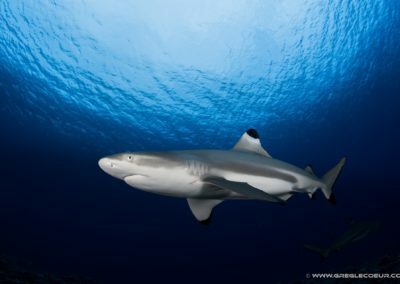 It is a shark that can be observed in schools, during the day usually resting on the bottom, in caves or on rocky overhangs. 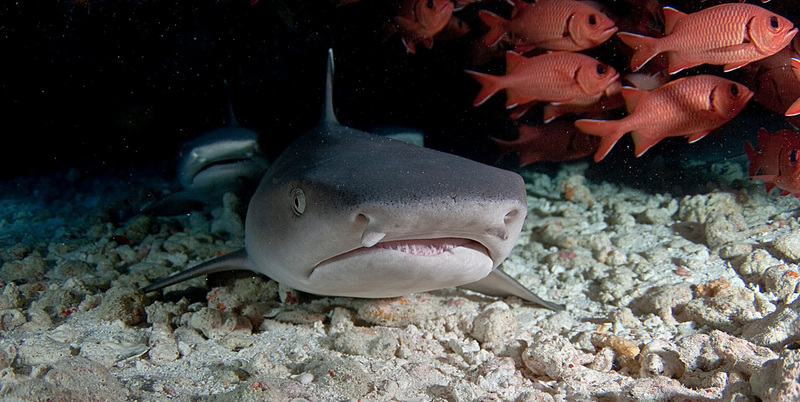 The white tip lagoon shark is found in coastal habitats, territory it shares with the black tips and lemon sharks. It becomes active mainly at night feeding on fish that it ferrets out of holes and crevices. Adult size: maximum 8.20 feet. 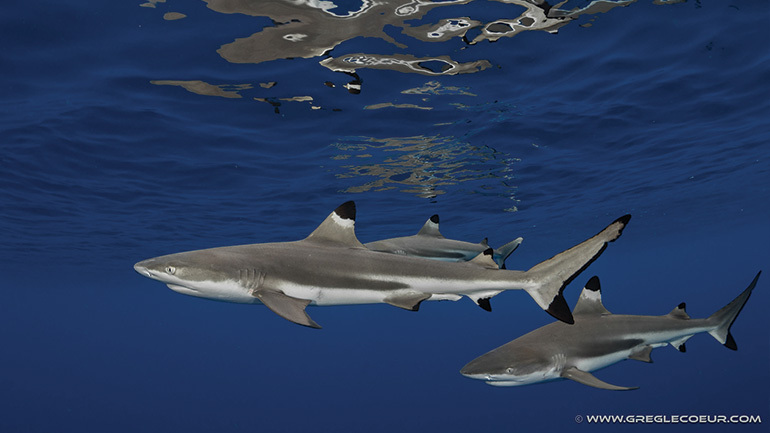 It is distinguished by its perfectly grey skin, white belly and its black edged caudal fin. 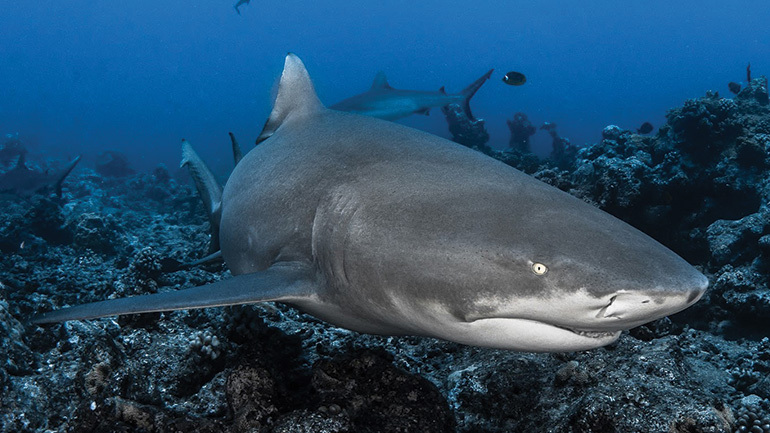 This shark has a lively and bold behavioral pattern notably observed in the presence of stimuli. 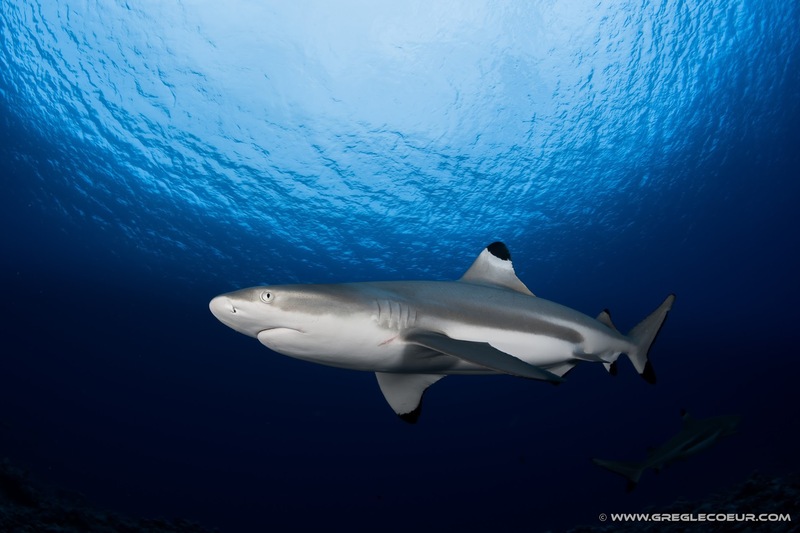 The Grey shark is described to have the vivacity of the Black tip and the strength of the Lemon shark. For this reason it is both feared and respected. 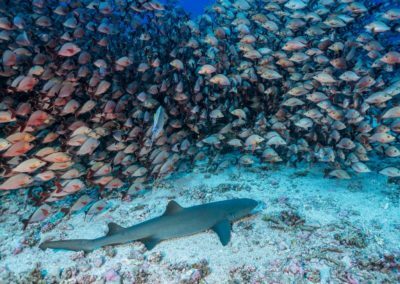 Schools of a few hundred specimens are seen during the day in the Tuamotu Archipelago. However, they split up at night, the period in which they are most active. Somewhat curious, this shark will not hesitate to curiously approach divers a few feet away only to scurry away shortly thereafter. They usually are found in the northern coast of Moorea at Tiki point, with the peculiarity of only female citings. 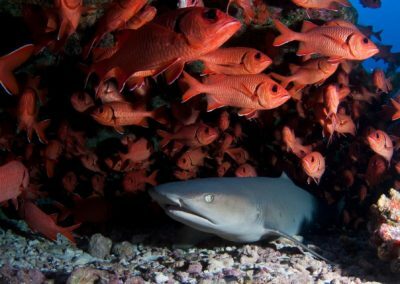 They are also found mostly in the vicinity of the reef walls and outside in the passes, from the surface to 100 meters in depth. 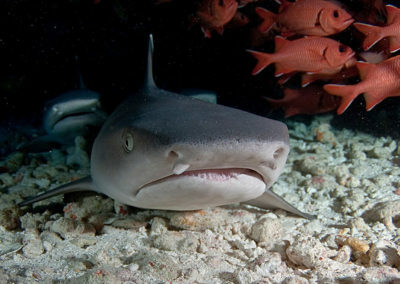 This is probably the most common shark in Polynesia. It is distinguished easily by the black tips on the edge of each fin. 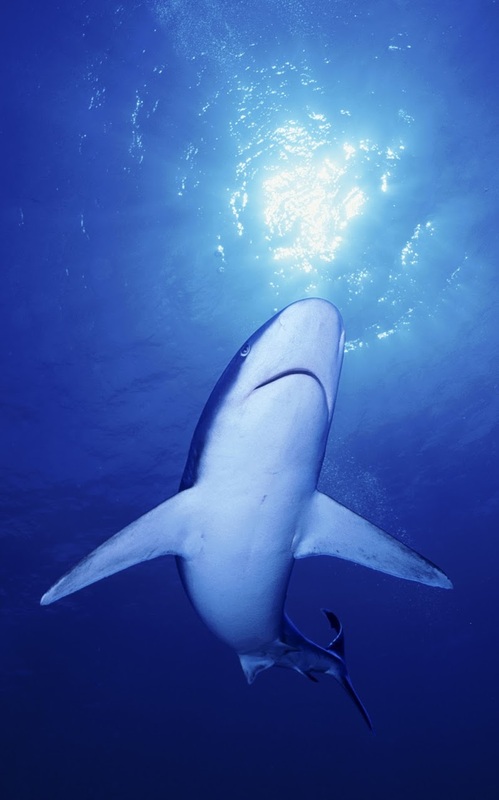 This shark is quite fearful and considered quite harmless. 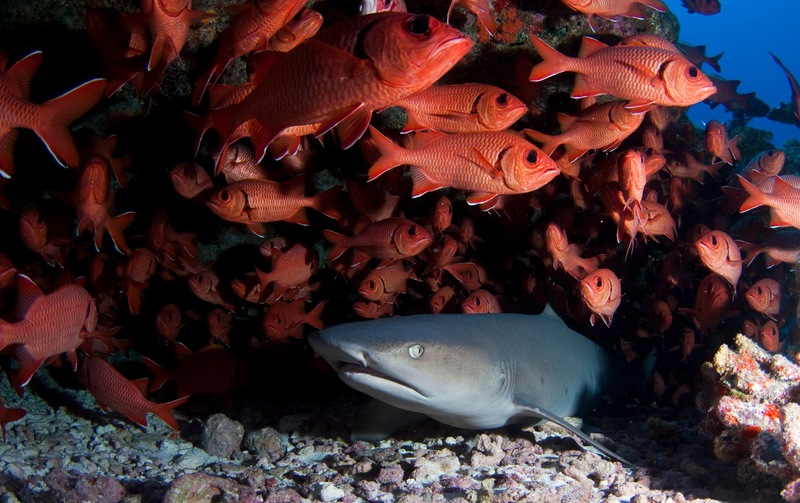 Although this does not keep them from coming close to divers just to satisfy their curiosity. Feeding patterns are nocturnal, mostly on sleeping fish they likely have trouble catching in the day. 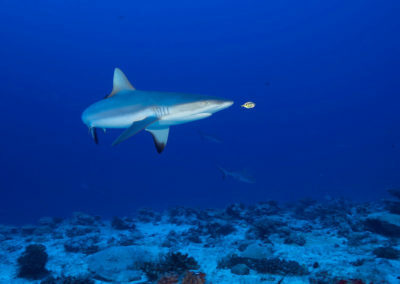 The Lemon shark has a massive body of a yellowish brown color, easy to recognize because of its large dorsal fins of the same size, its visible set of smooth, sharp teeth and its little yellow eye in the form of a lemon, hence its name. It is the lord of the reef, given its size and weight. 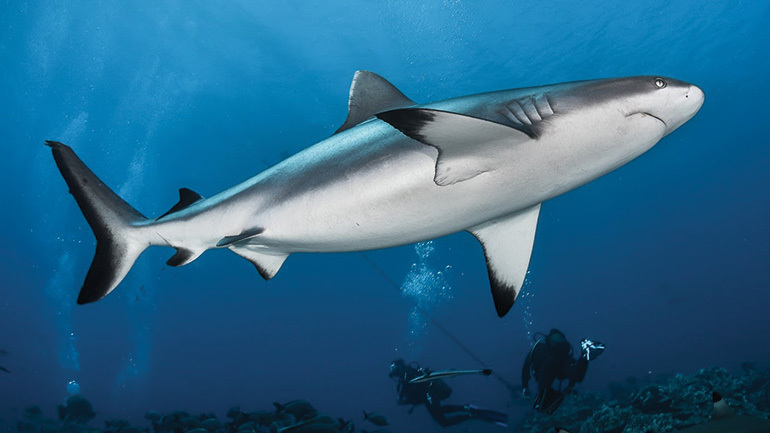 Reacts actively to stimuli during a dive and is considered to be one of the most imposing figures one can come across at the dive sites. It is often found resting on the bottom, close to the coast from the surface down to a depth of 90 meters. It is an active hunter of fish, shellfish, sea birds and small rays. During the course of your dives, you may encounter other shark species like the Silvertip shark, the Silky shark, the oceanic whitetip shark, the Tiger shark and even the Whale shark.